With Reflex 100% Whey Powder Strawberry & Cream, the clue is in the name; it’s a protein shake that delivers 100% of its protein from whey. Only the finest undenatured whey is used, with no added sugars, no amino spiking, and no soy protein, giving you the finest protein to supplement your fitness and sporting efforts. 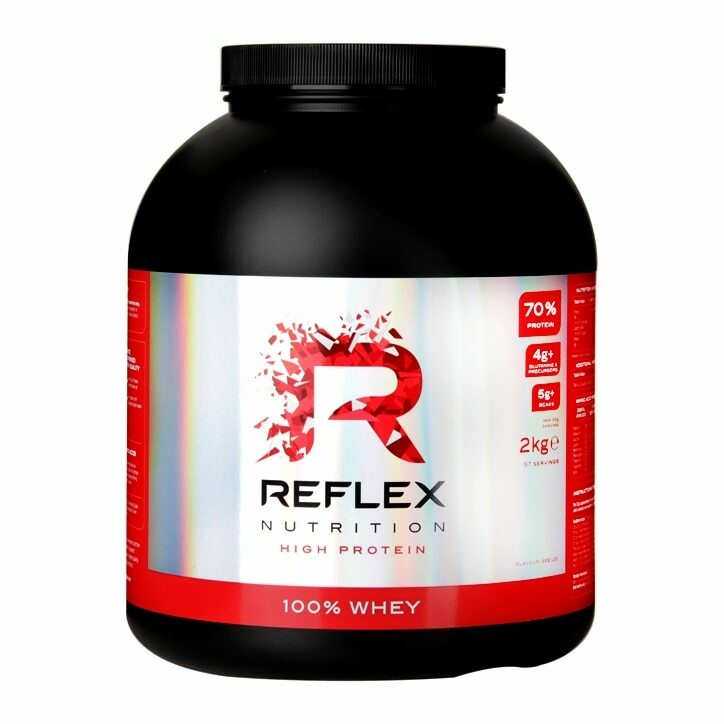 Reflex 100% Whey Powder Strawberry & Cream contains over 5g of branched-chain amino acids (BCAAs) per 24g of protein, which are arguably the most crucial amino acids for athletes. The three BCAAs are balanced at a 2:1:1 ratio of L-Leucine, L-Isoleucine and L-Valine, giving you the perfect equilibrium in every shake. Our whey protein is extracted during the cheese-making process, made with quality fresh milk under EU regulations, from cattle that are free from banned antibiotics and growth hormones. When it comes to your body and your nutrition, there’s no point risking mediocre products, and we think 100% Whey is one of the best money can buy. 100% Whey is ideal for men and women who train regularly, whether at the gym, through sports, or perhaps at workout classes such as yoga or pilates. If you are building and toning muscle mass, then 100% Whey Protein is for you. With such hectic lifestyles, ensuring we consume enough protein in our diets to maintain and build muscles is difficult. This is especially true for those training or working out regularly, whose bodies require more protein to adapt to the regular stress exercise places on muscles. Mix 35g, which is approximately one heaped 60ml scoop (scoop included in the tub), with 250ml water or skimmed milk in a shaker or blender. These are guidelines and a thicker consistency can be achieved with less liquid, or non-skimmed milk. 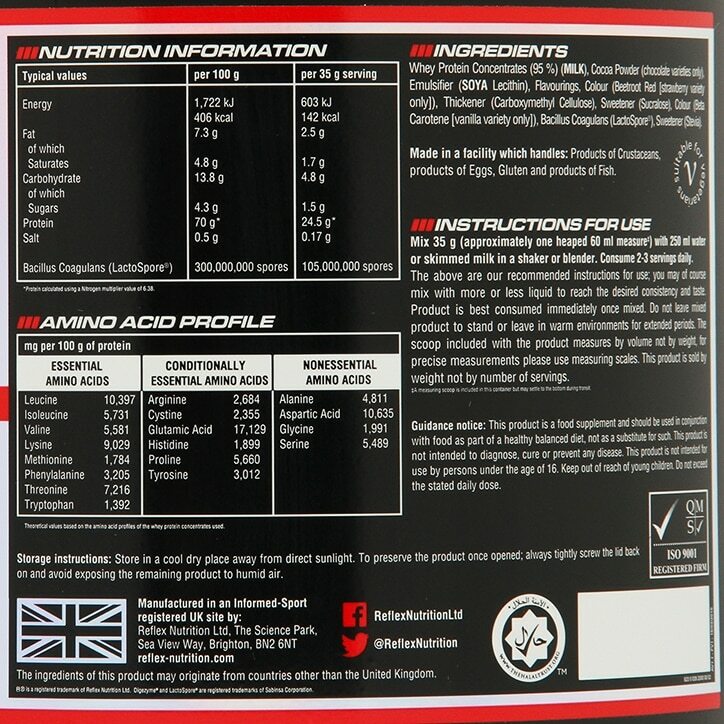 Reflex 100% Whey Powder Strawberry & Cream is rated 4.0 out of 5 by 2. Rated 4 out of 5 by Lizy from Great Great product, will definitely buy it again. I now have more energy and I feel fuller for longer !